Promoting Folk Music and Dance in Coventry, the 2021 UK City of Culture. Coventry and its surrounding area has a proud history of folk music and dance. Now the City’s success in winning the 2021 UK City of Culture Award offers a once-in-a-lifetime opportunity to build on this foundation and establish this area as a national and international hub for innovative folk performance in its various traditional and contemporary formats. CVFolk Legacy celebrates Coventry’s role (past and present) in national and international folk music, building on the reputation established by such acts as Dando Shaft, Whippersnapper and the late Rod Felton, the City’s Irish connection, the network of informal clubs and music sessions, the dance sides and local traditions. CVFolk Vision focuses on the present and future of folk in the City. By developing resources to support local folk music and dance clubs, and promoting acts with Coventry connections to become ambassadors for the city’s music, this strand will feature major events and concerts, with top quality acts who can appeal to a broader base of current and potential Coventry folk fans. The City of Culture accolade offers a fantastic chance for the folk circuit to revitalise itself, harness the high standard of musical talent in this area and promote a more positive message of itself. Furthermore, it provides a clear framework for wide participation by performers of all ages and everyone interested in the promotion of the folk arts in this area. Great looking site. Congrats to everyone for all the hard work that’s clearly taking place and every best wish for continued success. 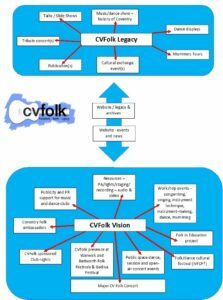 Cvfolk is a cracking initiative. Many thanks Martin. Much appreciated.